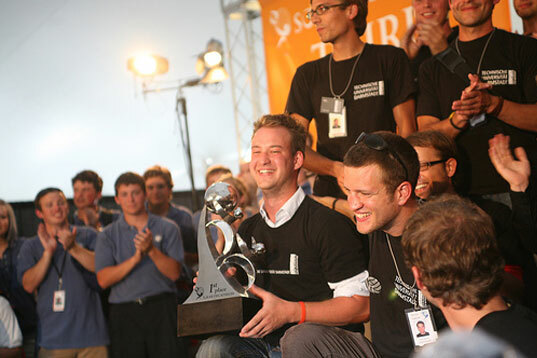 GERMANY WINS THE 2007 SOLAR DECATHLON! It has just been announced that the German University, Technische Universität Darmstadt is the winner of this years Solar Decathlon competition! In order to win this prestigious design competition, the German team had to beat out a whole slew of American universities on U.S. turf (the National Mall in Washington DC). Frankly, however, we’re not surprised to see a winning design emerge from the land of high-quality engineering. 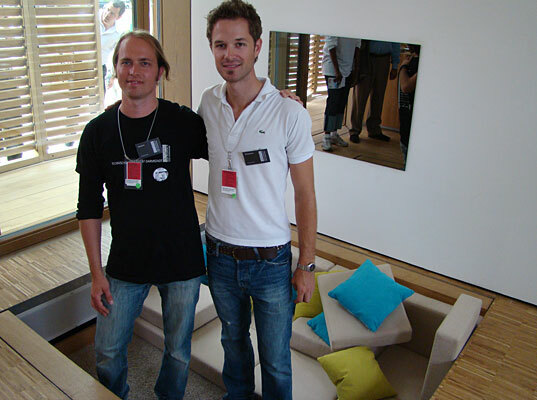 And the Darmstadt Solar Decathlon house was a worthy winner of the coveted prize. 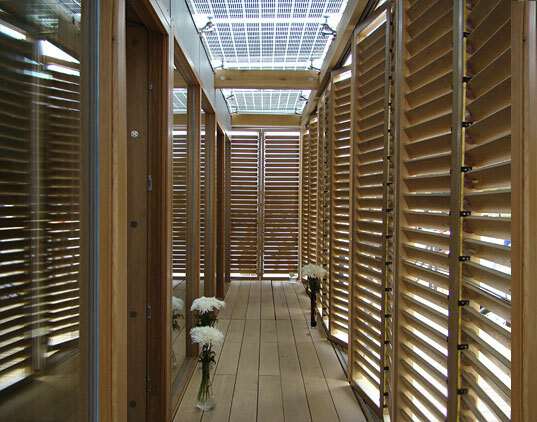 The stunning solar house was simple, elegant, and extremely innovative in its use of solar shutters and fold-up interior space. 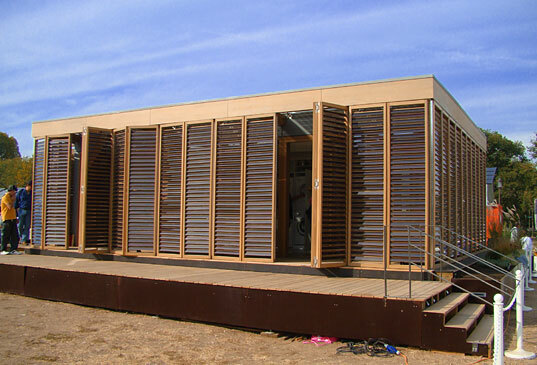 Over the past two weeks, the 2007 Solar Decathlon challenged twenty university-led teams from the U.S. and as far away as Puerto Rico, Spain, Germany, and Canada to design, build and operate the most attractive and energy-efficient solar-powered home. Students competed in ten areas, ranging from architecture, livability and comfort to how well the homes provided energy for space heating and cooling, hot water, lighting, and appliances. Technische Universität Darmstadt earned 888.45 points out of a possible 1,200 to win the competition, followed by University of Maryland with 872.45 points and Santa Clara University with 860.80 points. 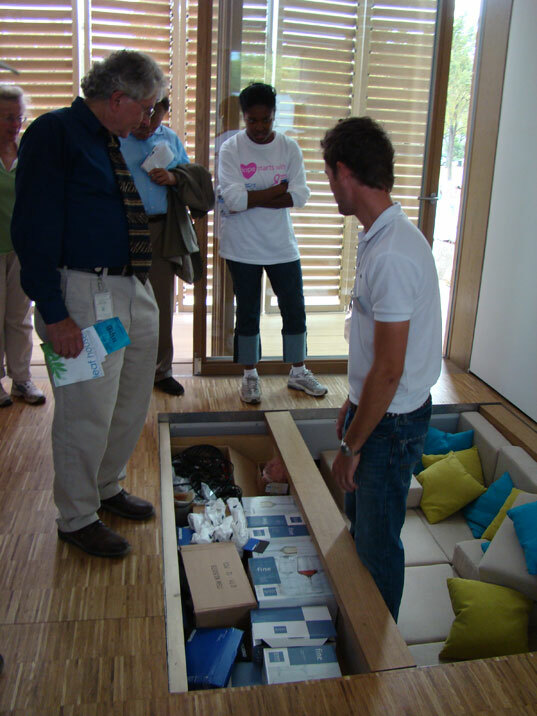 Combining the manufacturing expertise of Volkswagen with a beautiful modern design sensibility, the Technische Universität Darmstadt’s wowed the crowds this week at the 2007 Solar Decathlon with their gorgeously innovative Solar Decathlon home. 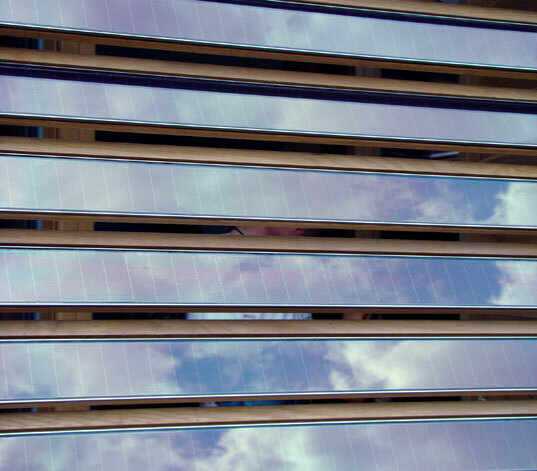 The Darmstadt home combines both high-tech active solar and low-tech passive solar components into smart operable building envelope of movable photovoltaic shutters. 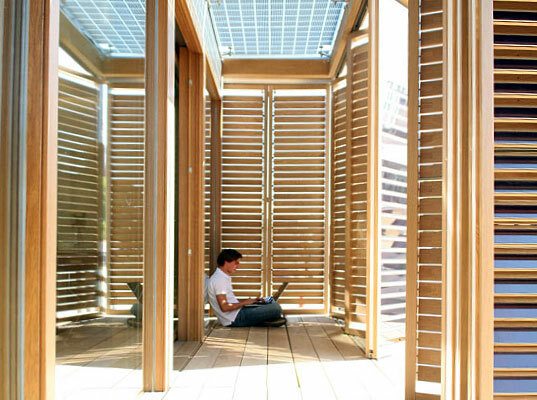 This clever solar shutter system bears more than a passing resemblance to old school German wooden shutters — only writ large, spanning every exterior surface of house and covered with photovolaic panels that generate electricity while they simultaneously shade the house from the sun. And the judges and viewers on hand at this years Solar Decathlon event seem to agree that the Darmstadt house is a cut above. Darmstadt won the first prize of the competition in the architecture round and have been continuing to rack up points in every category until this final victory was announced. Darmstadt also seems to be the popular choice at the show – the house was constantly mobbed by people and surrounded by long, winding, Disneyland-esque lines. The Darmstadt House design is based on a platform system which allows for customization and quick assembly, all made in Germany using German technologies and materials like local German oak. The student team began with an automotive-inspired and uber-German concept: In the 1990’s Volkswagen created the platform system for cars, and the student designers wanted to use the same concept of prefabrication and platform design to design an applicable and flexible system. The home’s platform system consists of a space for the building technologies, large spaces, and strategically-arranged interiors for floor integration and flexibility. The main structure of our house consists of three modules. The construction of each module, from bottom to top, is a platform, living area and roof. The platform is composed of a top layer and a bottom layer, between those two layers is room for technical installations, storage and integrated furniture. 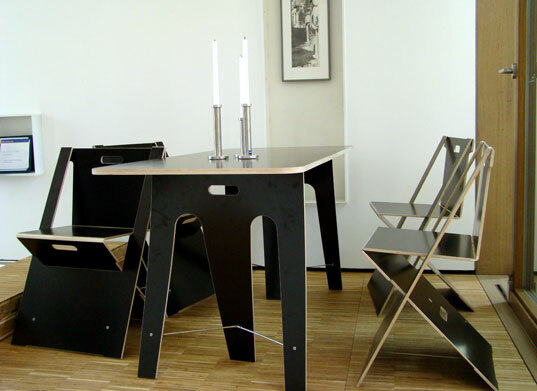 This platform system allows for innovative furniture and storage solutions which are embedded in the floor. Like something resembling a burrow — the bed, couches and all storage are folded into the floor, saving space in a unique and cozy way. Instead of focusing on the production of massive amounts of energy, the home focuses on keeping cool with passive solar design, meaning it demands a minimum amount of energy to function normally. To achieve this, the building’s shell became a central design component- the outer layer consists of oak louvered frames which, same as the roof, are equipped with photovoltaic panels. This layer both generates electricity and also provides protection from the heat of the sun. One of the most unique features of the Technische Universität Darmstadt’s home is their flat roof. While most homes at the Solar Decathlon utilize a pitched roof to maximize the efficiency of the photovoltaics, this home’s highly-insulated flat roof consists of multiple layers that yield insulation 10 times better in comparison to an equal thickness layer of polysterole insulation. And in true cradle-to-cradle fashion, the house will return to Germany after the Solar Decathlon and used as a solar power plant to power on-campus buildings and feed into the German power grid. That looks fantastic! Anyone know where that folding table and chairs is from? Is it sold here in the states? fantastic project - that wax is a very interesting compond. your analogy is a bit off. Rather than Volkswagon, you might better compare it to Mercedes or Porche. That is one very expensive little hut. But beautiful. If someone wants to find out more about the wax material used to capture heat, google for "micronal pcm". It is a product by BASF, there might be other producers. I know about the technology from its use in some motorcycle jackets where it is also used to regulate heat. 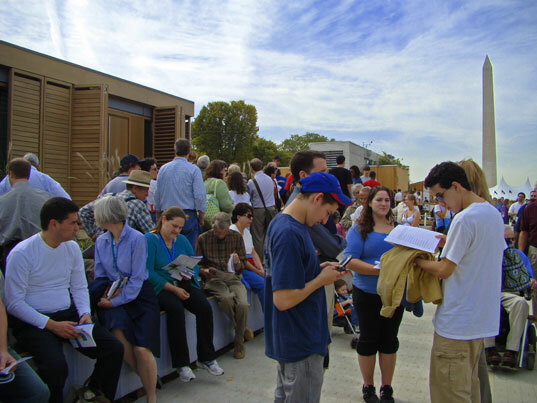 Side Note about Modern, Sustainable, Modular Residential Design, and all that is Pre-Fabulous: I saw no Michelle Kaufmanns, Marmol Radziners, RAZOR Studios, Workshop APDs, Ed Begley Jr.s, or Brad Pitts at the Solar Decathlon. But, LOTS of super cool techies & interested & inquisitive people (including Inhabitat’s own, Jill). It was a great learning event for the general public, and should have been so for the starchitects as well. One of the coolest things was the plethora of smart munchkins (I’m talking 7 & 9 yr. olds) asking adult questions about BIPV & Thermal Bridging! Our future designers!